Farmers are faced with replanting decisions every year. Cold temperatures, wet or crusted soils, and/or pesticide or fertilizer injury may reduce seed germination and seedling emergence. After emergence, stands may be further reduced from insects, diseases, wind, frost, hail, and/or flooding. Stands too dense or non-uniform because of planter malfunctions or variable seeding depth may warrant replanting. The major decision facing a farmer is whether it is more profitable to keep the original stand using a full-season hybrid or replant. Replanting may result in an optimum stand, but it would be planted at a later than desired date using a shorter season hybrid. To minimize losses, information must be collected and evaluated quickly. 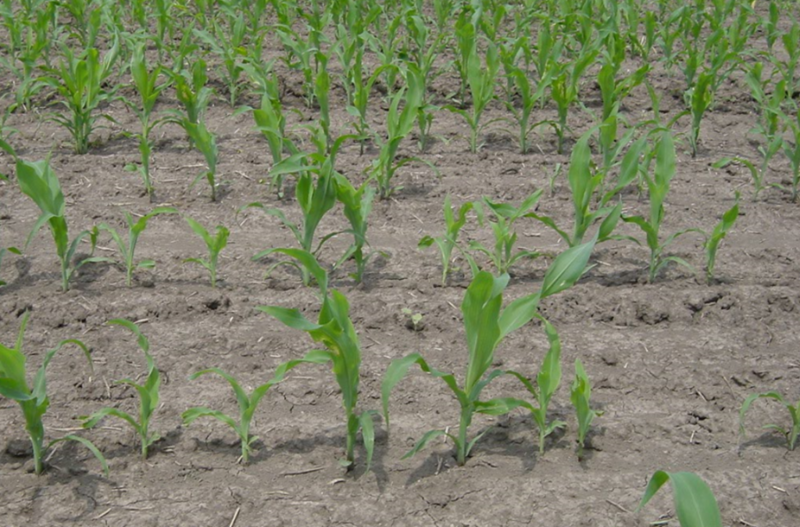 You’ll first need to estimate three factors: stand population, plant health, and evenness of spacing. Then compare the yield potential of the existing stand to the yield potential of a late-planted stand. When deciding whether to replant, you’ll also need to consider replanting costs, seed availability, rotation restrictions from previous herbicide applications, and possible alternative crops. Base your replant decision on proven agronomic facts rather than emotion.